“That’s Sacramento” the old timers say, as they shake their heads. 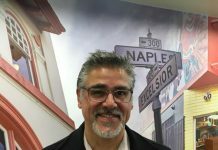 For the entire time that I’ve worked on housing justice in San Francisco, housing activists have told me about about our inability, year after year, decade after decade to defeat the Ellis Act and Costa Hawkins, two laws that were written for and by the real estate industry to limit the power of tenants, and the power of cities to govern themselves and preserve affordability. Even though Democrats have been in control all this time, maybe this shouldn’t be so surprising: California Democrats get a huge amount of campaign cash from these same real estate industry players. Meanwhile these laws have, of course, caused mass displacement. No matter how many evictions I encounter, the stories of displacement keep coming, and keep me up at night. One counselor told me two stories from a recent hour-long shift — two ladies, one in her 80’s, one in her 90’s, sisters. They lived with another sister who died; she was the leaseholder. 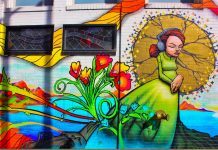 The two ladies were evicted, victims of the Costa Hawkins rule that does not allow subsequent occupants to keep the same terms of the lease. Now, they spend their days at the Senior Center, get one meal, and their nights huddled together at various hospital emergency ward waiting rooms. Another story was of an older man crying as he talked about his desperation in finding a place to live. He’s sleeping on a kitchen floor. Even this is only available to him during certain hours, and he has no other apartment privileges. He pays $650 a month in cash. At a price point like that, He wouldn’t even qualify for most of the affordable units that are slated to come online in the coming months and years. Meanwhile, my friend Patricia Kerman faces an Ellis eviction from her home of decades, a handful of blocks away from the Tenants Union. Kaushik Dattani, one of the “Dirty Dozen” repeat Ellis evictors, bought her building and “went out of the business of being a landlord” — despite the fact that he owns dozens more properties, and has done this repeatedly to other tenants. I went with Patricia to Sacramento to demand that San Francisco make a modest adjustment to the rule to prevent the repeat offenders, and the worst of these Ellis abuses. However, those Democrats with real estate connections let us down again. With the failure of action from Sacramento Democrats, she and her roommate have nowhere to go but the street. Then came the election of November 2016 — a whole new reason to keep me up at night. As the daughter of immigrants and a lifelong political activist I felt like a stranger in my own country. I have never been so grateful to live in San Francisco. I have never felt more clearly the need to support my neighbors who lack the privileges I have — or as a woman of color, to fight for space at the political table. In this brave new world we live in now, it feels like anything could happen. Everything we knew about how politics works has been turned inside out. There are looming threats from far right forces on many fronts. We will have a Real Estate Speculator-in-Chief with zero experience at governance, who rouses his base with racist and sexist messages about leadership. Most likely, housing discrimination will be much harder to fight. Rent Control could be overturned. Federal housing subsidies could disappear, leaving millions more like these elderly neighbors in desperate situations across the country. We have no idea what is to come, but we know we have a fight ahead. At the same time, we also saw massive enthusiasm, trust, and respect for a socialist who ran as a Democrat on a message of economic justice and resisting this inequality and corporate influence. We see a growing movement of people who are getting engaged in new ways they never expected in order to take their country back from corporate and right wing control. We also see leaders in our city and our state who are using unexpected language of resistance. The beautiful Joint Statement from California Legislative Leaders on November 9th brought tears to my eyes- They said that they too woke up feeling like strangers in their own country, and will do all they can to fight Trump’s vision of America. The next day our mayor surprised us with his statement that San Francisco will continue to be a sanctuary city despite threats from the Federal Government. Of course, I’m skeptical that this was more than empty words. The hard questions are: What state and local programs are going to suffer, and who will suffer most, when the federal government stops funding? And how can California, and especially socially liberal coastal cities, be a refuge for the most vulnerable if it costs too much for immigrants, the poor, the disabled and elderly, the LGBTQ, the low income workers, or even the progressive organizers to live here? In the case of Mayor Lee in particular, it seems likely that these words were platitudes, with no plan behind them. But the fact remains that these words were said. Politicians know which way the wind is blowing, and they know this message is resonating right now. What better time could we imagine to reject the corporate and real estate agenda, and fight for the platform and leadership we really want? California is only one state, but it is huge. And right now, the Democratic Party is the biggest game in town. With a supermajority in both houses, control of the governorship, and both Senators and three quarters of the US Representatives. The California Democratic Party could potentially be a significant force against many areas of federal onslaught — education, health care, climate change, progressive revenue, criminal justice reform, and of course, affordable housing policy. The California economy is big enough to create a real alternative the rest of the county can envy, or imitate — single-payer health care, overhaul of our criminal justice system, bans on fracking and offshore drilling, and, of course, finally repealing those laws that keep forcing San Franciscans out of their homes. However, we can’t count on the Democrats in power right now. It’s up to us turn these feelings of resistance and justice that we feel right now in California into concrete action in every way we can — whether it’s direct action, new political formations, or organizing. Additionally, it’s up to us to build leadership and expertise that is NOT beholden to moneyed interests, and is firmly rooted in principles of economic and environmental justice, while developing the leadership of people of color and women. On Sunday, Democrats in San Francisco and across the state will get to choose delegates to represent them at the State Party level. These delegates will vote on endorsements, party platform, and party leadership. Voting for these progressive Democratic Delegates is merely one small step in the direction of moving the overall power base in California to the left-but it is something we can do NOW. I have joined a slate of candidates in AD 17 and AD 19 which includes young activists and experienced political office-holders, political strategists, labor and community organizers, Berniecrats, and longstanding progressive democratic clubs, tenants rights advocates who have come together under one platform: We will resist Trump AND the Corporate and Real Estate Democrats who fail to offer a just alternative. 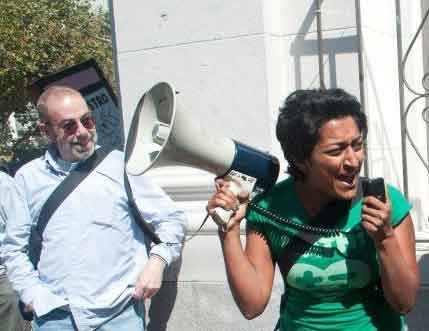 Deepa Varma is a longtime housing activist, former eviction defense attorney, and now the director of the San Francisco Tenants Union. **Update: Our message of change and challenging corporate control of the Democratic party has resonated so deeply already that a competing slate including many centrist politicos coopted our platform almost line for line, and call themselves progressive! We are clearly doing something right. 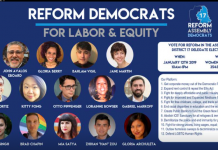 The Tenants Union, Milk Club, Berniecrats, and Progressive elected officials and many Progressive neighborhood Democratic clubs endorse the Reform Slate. Previous articleVOTE Jan 8 to reform the Democratic Party! Next articleGuardian Archives Project phase 1 launched!